Since I first tried paper piecing hexagons, I tried many needles and threads. I finally settled on Milliners Needles (size 10) made by Richard Hemming & Son, which I use for basting and whip stitching. For basting I use all of my old thread since it gets removed any way. For whip stitching thread I tried Superior Bottom Line, Essentials (100% cotton), YLI Silk, and Superior So Fine (#59/3 ply). While I love the way the Bottom Line disappeared, it was tricky to thread and slippery to work with. My favorite to work with is Superior So Fine. I get all my paper templates (hexagons, diamonds, etc.) from Paper Pieces. It saves a lot of time and I find the quality to be very good. I use the 1 1/2" hexagons. 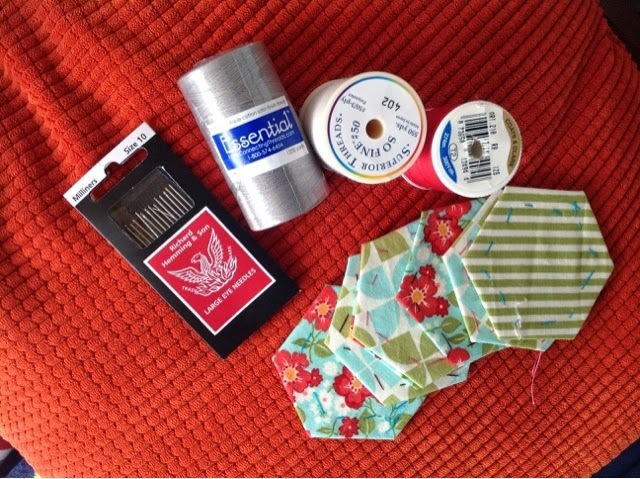 If you choose to use the 2" hexagons, then you could use a 5" charm pack for fabric. My favorite online fabric store is Missouri Star Quilt Co.